I always emphasise that your virgin hair extensions are just as important as your natural hair. I treat mine pretty much the same way I treat my hair. Obviously there’s no prepoo, tea rinse, deep-condition with heat, chill… BUT, we pay a lot of money for these extensions and should make the effort to care for them. Imagine my surprise when I discovered there was a full range of hair care products dedicated solely to extensions. 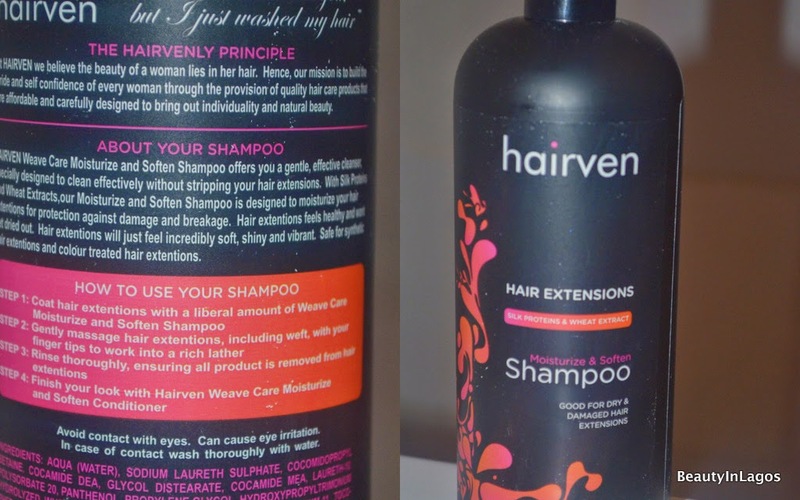 I am talking shampoo, conditioner right through to leave-in and serum. Hairven is an indigenous brand, and quite frankly the first of its kind that I have ever heard of, ever. Listen, we need to believe that most of these our homegrown brands understand quality is key and should not be given a side eye because they’re championed by our fellow Nigerian. As some of you may know, from my instagram page, my hair at the moment is blonde, which means it has been bleached to attain it’s current colour. Bleaching dries out the hair, I got mine done professionally and the lady did an awesome job restoring moisture to it after all the dyeing. But I notice that with lightened hair I always need to apply some serum to my hair, especially the ends, before I use any heat, otherwise I get crunchy hair and split ends. I always start my hair extension (even my natural hair) wash with conditioner, yup you read that right, and I start off with dry hair. I read somewhere that hair is like a sponge and if you start with it dry, it will absorb everything better. I apply conditioner from top to bottom, coating the hair all through and then running a wide-tooth comb through to make sure that I get the product distributed evenly. I usually wash my extensions when they’re off my head and in bundles, so I just wrap them up in some old carrier bags and leave alone for 15mins. But this time, I had them in as a weave, so I just cross-pinned my hair up with two hair ‘crabs’ and headed off to the salon to get it rinsed out. I must’ve had the conditioner in my hair about 20mins by the time I got to the salon, so it wasn’t in too long. I strongly advice you don’t leave the conditioner longer than 30mins max, I won’t even push it that long. Because from personal experience, where I left it in too long, it weighed the hair down and just left it limp and without volume, even after a blowdry. Before they rinsed the conditioner out, I put some shampoo in an applicator bottle, mixed in water to dilute and asked the guy washing my hair to run this all through my scalp between the braids and weft. This way I get my scalp and weft clean and when he rinsed it all out the shampoo would run down the strands of the extensions also cleansing them in the process. If it hadn’t been on my head, I would have applied the diluted shampoo to the weft in a bundle and washed it in my palm using circular motion, then rinsed it through the strands. Once done rinsing, I was put under a hooded dry to get my braids and weft dry. Once my extensions, braids and wefts were 100% dry, he applied a dime size of serum to his palms, rubbed them together and ran it through my hair, once again concentrating on the ends. He blowdried my hair to stretch it out and then curled it all through using a curling iron. Results? Silky, bouncy, shiny hair. I had really high hopes for these products and they met all my expectations. Even now my hair has a ‘glow’ to it and it is so soft. 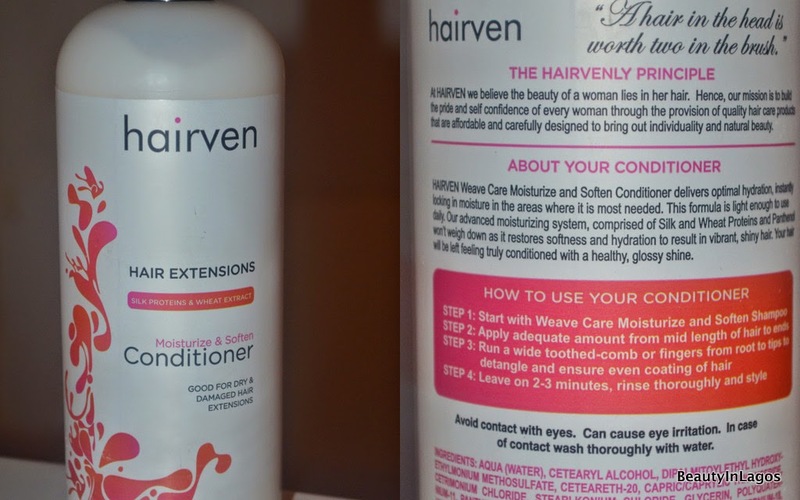 Will I recommend Hairven to you? ABSOLUTELY! I love these products, they actually revived my hair. Now you do not necessarily need to use them my way, feel free to do what you want with them. But I am very impressed with these and already talking my friends and family into getting some. Hmmmm! And the packaging is a lot like tresemme. I should try this out!